Ted and I went to Morro Bay – Tognazini’s for lunch. It was a fabulous Fall day – crisp and clear. No wind (at least at noon). This sea gull was happy to join our lunch…. 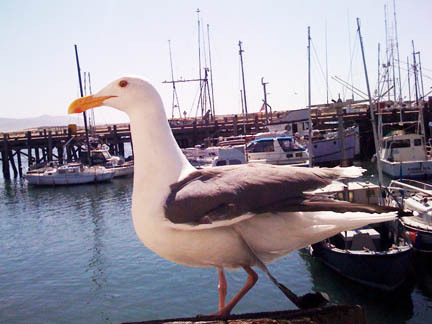 Ted didn’t really think that calamari and chips (fried) were on the approved list for sea gull diet – but in true Gray-family fashion I couldn’t resist sneaking him a few tidbits. He was grateful. Tognizini’s is at the T-pier in Morro Bay – it’s mostly a seafood shop – with a patio dining area and a fish and chips-mostly menu. Good food. Dogs welcome.